Frenetic: having extreme enthusiasm or energy. I love that frenetic means extreme enthusiasm because this is entirely perfect for describing the illustrations of Mackintosh. There is this remarkable frenetic energy in his work; a smash up of typography, illustration and graphic design which is visually sophisticated and has major child appeal. 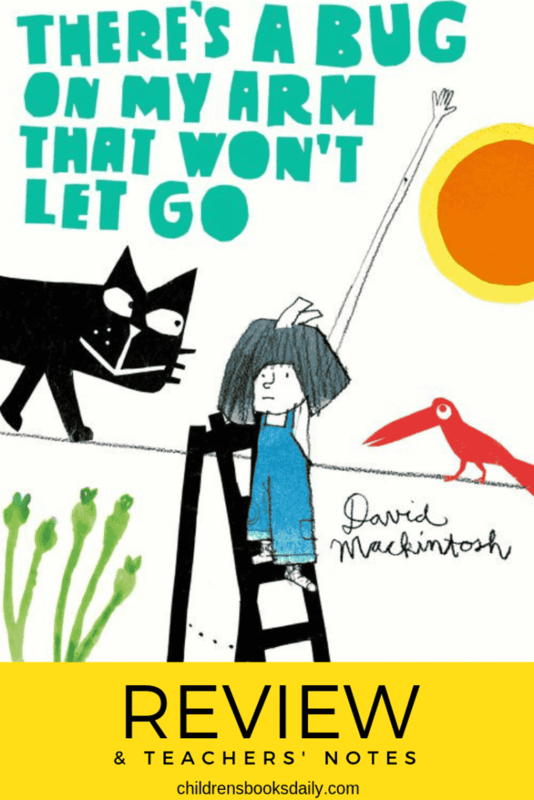 David Mackintosh doesn’t talk down to young readers, they have to rise to the challenge of his multi-layered, humourous and totally engaging books but it is a joy and a delight to do so. 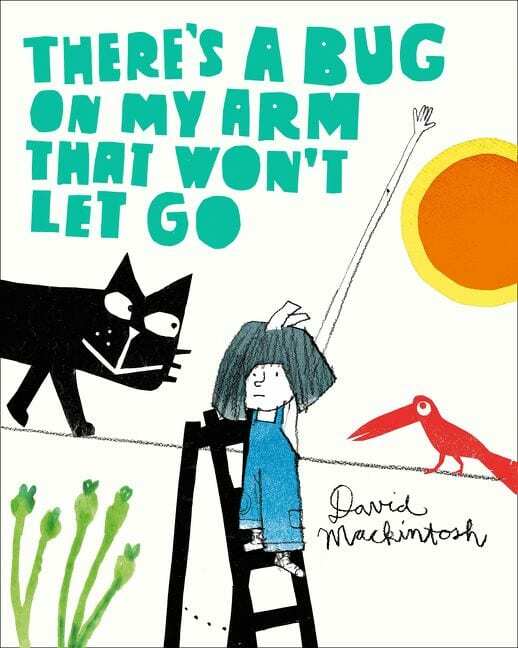 Like ‘Lucky’ (see my review and interview with David Mackintosh here), his latest picture book, ‘There’s a Bug on My Arm that Won’t Let Go’ has made me laugh many times over and I’ve had such fun reading it to classes from Kindergarten to Year Six – there is something for all ages in this seemingly simple story of fear turning into understanding and friendship. When a little bug looks for safety on a little girl’s arm and won’t let go, she moves from annoyance to affection in this stylishly atmospheric and quietly unforgettable tale. A modern-day fable about being a friend and the contentment that can come your way when you choose to be kind makes this an important book for today’s new generation. Discuss the title and cover of the book. Why do you think the child’s arm is very long? Is it extenuated to display what the title is about? 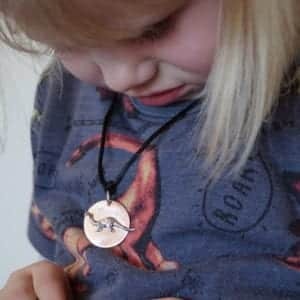 Does the child look as though he/she wants the bug on their arm? How do you know? There are some other characters on the front cover. What part in the story could they play? Look at the way the author/ illustrator has produced the front cover illustrations. What has he used? (texta/felt, crayon, collage etc). Why do you think he has done this? The words BUZZ OFF?! are written in very large font in the blurb. Why do you think it has been done that way? Does it attract your attention? 3. Find out more about the author David Mackintosh. Did you know he lives in London? He was born in Belfast but moved to Australia when he was very young. He played a lot of sport when he was at school. He loves to draw. David has illustrated and written many children’s books. Check out this interview with him for Children’s Books Daily. On page 19 (written inside the black cat) descriptive words (adjectives) are used to describe fur, arm and hair (nouns). What are they? (soft fur, spongy arm, golden hair). Replace the adjectives with others. How else could fur, arms or hair feel? How has including these adjectives made the text more vivid? Try changing this text with the class group. Write it on the whiteboard. Melody’s. But she’s not coming outside today. And Pearl just sits there in the sun. Once student have mastered the replacement adverbs and adjectives (and nouns), get them to produce their own. Discuss the illustrations in the book. Some are collage, crayon, felt, paint or pencil or a combination of all of these! The cat on page 19 is made up of a combination of some of these. Discuss with your students what they are and how they would have been created ie: layering of the different mediums. Discuss different interpretations of the illustrations that students may have. Why did you think that? For example some students may believe that the cat on page 19 may be happy or sad or content – none of these are incorrect. It is all about individual viewpoints. The text on page 19 is inside a cat, because it is related to a cat. It could also have been written on a bug, an arm, Melody etc. With students’ changed text, get them to design a background for it. Place the text creatively on it. Have students present their work to the class discussing how they created their work and why. This book could be used as one of the moral and teaching stories for comparison for this Elaboration. 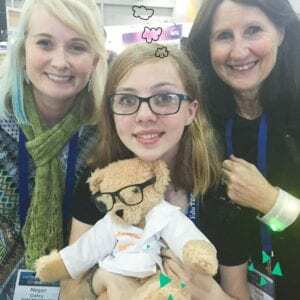 What kind of personality traits does the main character have? How does her character evolve from the beginning of the book? On page 6 the main character’s arm is drawn long for the first time in the book. What is this telling us? And the text says ‘There’s no way in the world I’m going to touch it and I don’t want it anywhere near me.’ What is this telling us about her character? On page 12 the main character’s personality starts to come into light when she stands up for Melody after everybody called her Scratchy. Are we starting to see a different side to the main character’s personality? Page 12 and 13 show the main character gently offering different activities for the bug to do. Discuss how the character is evolving. Page 22 shows the main character’s arm back to normal length as she saves the bug. What is this telling us?